How Much Do You Want to Succeed? It has just been one of those weeks. I’ve been working hard to advance in my career and that involved a 3 day professional education program in the middle of the week before summer semester final exams. I’ve been waking up at 5 AM to leave by quarter to six and hopefully getting back before 8 PM and crashing before I’ve even finished my dinner. That kind of week, we’ve all been there. When we have these weeks it’s really easy to lose focus, and take our eye off the prize and I wanted to share my favorite motivational video from the Spartan Race series. If this doesn’t inspire you to go out and train for that 5k or chase a new one rep max or ask for more responsibility at work, you should probably reassess what your focus is on and where you want to succeed. I think that the most important thing you could ever do to get healthy and lose weight it to stop dieting and start focusing on changing your lifestyle. It’s about what you put into your body every day, and how well you treat your body and mind. I don’t consume High Fructose Corn Syrup. I think we all know that HFCS is bad for us, but until earlier this year when it was finally explained to me how our body reacts to fructose, I made the commitment to cut it out for good. I was raised on soda, and it was my final battle to get fully committed to the paleo diet to cut out traditional soda (diet soda freaks me out, so I’ve avoided that for a while). This also eliminates most commercial baked goods, and I’ve also made it a personal goal to only eat baked goods that are homemade. I love to bake, and there are some amazing bakers in my family, so I know better than to think I can cut them out all together all the time. I only purchase ethically treated meat. There was a period during the end of my college career when I actually went vegetarian because I couldn’t control where my meat came from. I try to only give my body what it expects (real food), so I ask the same of my meat providers. Grass fed cows have high omega-3 levels, and my father-in-law’s truly free range chickens lay eggs with the richest yolks I’ve ever seen. I fully believe that we vote with our dollars and even my Martin’s grocery store in the middle of nowhere carries organic/grass-fed meats and a whole host of organic veggies and the variety grows every month. You have the ability to make these foods available in your area by making requests and avoiding the conventional options when you can to make it happen for you and your family. I trust my body to do amazing things. This is my rule for rock climbing. I know I could be an amazing rock climber if I just got out of my own way. This is probably my biggest challenge, as I constantly doubt that I can stand my body up on a tiny hold or lift that weight during training. My husband and I encourage each other to go that extra mile when climbing by our shared mantra of “Just one more try” and it’s amazing what you can accomplish with just one more try. I trust my body to tell me when to stop. I don’t believe in pushing through the pain. Pain is your body’s way of telling you that you’ve done something wrong, and I don’t think that’s something to be taken lightly. I also listen to my body to tell me when I’ve eaten something that doesn’t agree with me, even if it’s a natural, whole food. I recently discovered that my stomach doesn’t handle cashews all that well, and have grudgingly eliminated them from my diet. I read every day. I have been a bookworm ever since I was little. I’m a bit of a book snob and refuse to buy a Kindle, but I believe that you should never stop learning. Whether it’s a textbook for my class, or my leisure book of the moment, I try to get at least half an hour in every day. I talk to myself like I would talk to a friend. We all have a tendency to beat ourselves up over every little bump in the road, and it’s not doing anyone any favors. If your friend told you that they just went through a really stressful day and ate a whole pint of ice cream, you wouldn’t berate them over it, you would let them talk it out and try to help them figure out what to do better next time, so why wouldn’t you do the same for yourself? I think that if I can become my own champion, I will see huge returns. So that’s how I guide my life, what is one rule you try to implement every day to make your life better? If you have your own list posted up, please share your link in the comments so I can come check it out! When I was a kid, I don’t think I ever saw a rock formation I didn’t want to climb. I remember going on hiking trips with my family and mainly just wanting to stop at the viewpoint with all the rocks, there are probably enough pictures of me on those rocks to pretty well document most of my childhood years. I have a feeling that I’m not the only person with a childhood love for conquering the rocks, and it naturally became part of my fitness routine. You should be getting most of your power from your legs and glutes while climbing. The nice thing is that you can hit all part of your lower body from hip felxors to calves to quads in one route because you may be forced to stand up in a number of ways. A serious step up from static squats and lunges! Even though your power comes from the legs, your forearms and shoulders will get a workout like they’ve never seen. You get your grip strength from your forearms and the first day you get on a wall, you will discover muscles in your forearm you never knew you had. The thing all elite-level climbers have in common is a back that could bend steel. You do row-like motions to reach the next handhold and like any good row, you need to be squeezing those shoulder blades to activate the larger muscle groups and do more work with less energy. Finally, like any body weight workout worth it’s salt, you will get a great core workout. Climbing creates some natural instability even on the easiest routes and you have to engage that core to keep yourself upright. Once you progress and start going over pitches like super girl in the above picture, your core both front and back will be one of your greatest assets. The less physical, but equally important, reasons to rock climb are what keep me coming back. As a bigger girl, rock climbing has not come naturally to me. At 230 lbs I have no business being on a rock wall, but I go 2-3 times a week and I know that I have a community behind me that cheered me on when I finally reached the top of my first route after months of practice. It’s similar to CrossFit where you get to go to a gym where everyone knows your name and celebrates your victories. I love the staff at Vertical Rock and never worry about asking a noobie question. Finally, and perhaps most importantly for those at all fitness levels is that rock climbing teaches you to trust your body. My new rock climbing mantra is “I trust my legs to stand up”, because despite the fact that you know you’re tied into a rope and can’t fall, it can still take some convincing to get your body to stretch its limits. More advanced climbers, like my husband, have to learn how to balance their weight on increasingly smaller holds and climb smart not hard. It’s a constant learning experience and gyms are always updating routes to provide new challenges to all of their climbers. So I challenge you to do a quick google search for “Rock Climbing [your area]” and you might be surprised to find a gym where you can learn the ropes isn’t that far from you. They’re becoming more and more popular, and rock climbing is even a contender to become the next olympic sport! So this week was a bit of a false start on my epic woman-with-a-plan 10 week workout. This was my first full week of summer semester classes and much like the workout it’s only a 10 week semester so there’s an equal amount of work shoved in to two less weeks. No excuses, I just underestimated the amount of time I would be spending on my studies. However, I did get a couple of workouts in this week and despite the huge number of reps, I did not struggle as much as I expected to. I decided for at least the first few weeks to break the total number of reps into two sets if I was working with numbers over 20 just to make it a little easier and make it into a HIIT type of workout since it allows me to keep moving. I hope by the end of 10 weeks that I’ll be able to do both the pushups and russian twists without having to modify. So I’m going to go into this week with more realistic expectations, and try to get at minimum 5 out of 7 days worth of workout under my belt this week. I recruited a friend from work to do it with me, so hopefully that will help this week be a more successful start than last week was for me. Hope everyone had a great weekend and an even better week! Jillian is like my fitness psychiatrist, I don’t agree with everything she says, but she’s got the why behind weight gain and obesity down to a science. I can’t agree that weight loss is simple math and if you take in fewer calories than you burn that you’ll get the body you want. However, I love the banter between her and her producer and she gives some advice that blow my mind sometimes. If you need some real talk in your life, or are looking for something to inspire you to start your journey or take the next step, give Jillian a listen. I’ve been eating paleo for almost a year now, and Jason and Sarah have really helped me to shape my plan. They break it down in a way you can understand, and never get too technical, and always sound like they’re having a good time. Thanks to these guys I’ve started eating more protein and fat throughout the day, and have started to ween myself off my morning smoothies. These are the guys to ask if you have questions about making it over the cravings hump or burning fat. I have Jason’s newest book “The Paleo Coach” and I can’t wait to dig in and help dial my eating in. 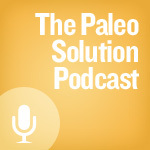 Robb Wolf hosts The Paleo Solution, and if you’re interested in the biochemistry of what you eat, this is a great podcast. I have an educational background in the sciences, but I think even those with a very basic understanding of how the body works could follow most of the episodes. 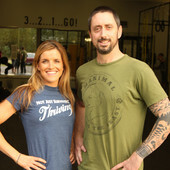 Most of their training tips are more male-centric, but if I ever had a question about what I needed to do to dial in a specific effect (reduce psoriasis flare ups, set a new PR, or paleo pregnancy questions) I would ask these guys. Those are my top three, what are you guys listening to on the road or treadmill? I always love new recommendations. And there’s nothing more dangerous than that! For a while I had the benefit of small group personal training at my gym, but like so many others, it just isn’t in my budget anymore. That was about two months ago that I decided to leave the program and my strength training has fallen by the wayside ever since, but I finally found a plan that instantly got me excited. I have a bit of an obsession with planks. They’re something I’ve never been great at, but I always feel so powerful when I can extend my hold time. My best during group training was 2 minutes, and I would just about do cartwheels if I could hold a 5 minute plank. 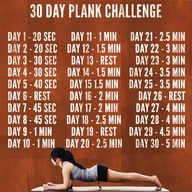 I have a feeling it will take me longer than 30 days to get there, but I’m going to replace the plank sets in the 10 week workout with those in the plank challenge until I make that 5 minute mark. After much frustration and many false starts I have come to accept that almost any time I start a new fitness routine or get on a really solid roll with my diet, I either get injured or sick. I recognize that I’m the architect of my own destruction most of the time because I tend to jump in too fast andtry to do too much, but I do think that things like injury and illness are a natural part of any journey, and how we respond to those events can make all the difference. At the beginning of April, I started the Couch 2 5K program in preparation for a host of 5k races I plan on running this summer. I’ve never been much of a runner, but the interval system worked really well for me and I busted out 1.78 miles in half an hour, a feat I never thought possible of myself, much less on day one of training. I was so excited to keep going, “I can really do this!” I thought. And then life intervened. I got hit with Norovirus, a very aggressive stomach virus, and was down hard for a full week. No solid food, a close relationship with the bathroom, and a whole lot of napping later, I lost 6 lbs of muscle and it took me two weeks to even feel like I could go back to the gym or go rock climbing. The first week I went back, I tried getting on the treadmill, ready to repeat my successes from earlier in the month, and got a rude awakening. I made it a whole 15 minutes in, which includes a 5 minute warm up walk, and felt like I was going to die. My hip flexors went all out of whack, and to avoid injury I stopped right there and went to do some post run yoga, and try to figure out what was happening to me. I had to accept that my road was going to be a lot longer than originally planned and being discouraged wasn’t going to get me anywhere. I resolved that I would do as many intervals as I could, and try to add at least one more each running day. Finally, on Friday I had worked myself back up to the whole workout, with a quick breather because my cardio endurance is a little slower to catch up than my muscles, and I finally almost match my original success in that first workout. Accept your circumstances without judgement. You got sick or pulled a hamstring, it’s okay! Take a moment to think if you were ultimately responsible for this, either by overtraining or not eating in a way that supports your current level of training, don’t beat yourself up over it, just don’t make the same mistake twice! Give yourself time to recover. You need to allow your body fully recover from whatever your setback is before getting back out there full force. I took two weeks off to get nutrients back in my body before I even considered going back into a workout. Take this time to focus in on your diet to get your body back to its best self. Work yourself back up to normal. Chances are, after a break of even a week, you’ve lost some strength or endurance. Try a normal workout, but listen to your body very carefully to figure out where you are, and create a plan from there. Do you need to try and add more weights or sets each week, or one more interval in each work out? Make a plan and stick with it. This might be a longer journey than expected, don’t try to take shortcuts or you’re just going to wind up back at the beginning after another injury. Celebrate the small victories and you’ll get back up to normal before you know it! What is the worst injury and longest recovery you’ve ever dealt with? What advice would you have for those dealing with their own set back?